Even if you've summoned the courage to fight past Mr. X and help Leon and Claire survive the zombie apocalypse, doesn't mean Resident Evil 2 is done scaring you. We're just days away from the February 15 launch - that's this Friday - of The Ghost Survivors, free DLC telling what-if stories about some of the characters you've met during your fight through Raccoon City. We already knew the free (woohoo!) DLC was coming, but Capcom has revealed more details about these side stories in a PlayStation Blog post. 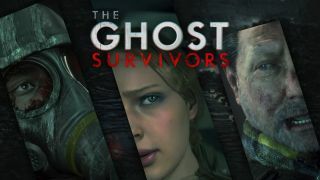 Minor spoilers, but these three starring characters didn't make it in the main game's story - so The Ghost Survivors is a non-canon look at what could've happened if they had survived just a little bit longer. It's broken up into three storylines: "No Time to Mourn" starring gun shop owner Robert Kendo, "Runaway" featuring the mayor's tragically murdered daughter Katherine, and "Forgotten Soldier" which follows a U.S.S. agent codenamed Ghost (who's likely part of the same unit as Hunk, star of The 4th Survivor bonus mode). This isn't just a chance to see how these characters would've handled Racoon City's fate - it's also an opportunity to go up against some new zombie types. Kendo will have to contend with the infected spewing clouds of purple poison, Katherine needs to evade mutated, extremely resilient undead, and Ghost is up against armored, moldy looking soldiers. Along with the regular difficulty level, you'll have the option to take on The Ghost Survivors in a Training mode that offers up more items and item slots for a much easier time. Completing the three scenarios and the challenges that come with them will unlock little cosmetic accessories and trinkets, so you can make your hero look all cute and cuddly in defiance of all those ugly, flesh-hungry zombies. You haven't lived until you've seen an adorable raccoon nestled atop the head of a hardened survivor. It's also great to see developers giving away full chunks of content for free in this season-pass-filled era, so everyone who owns Resident Evil 2 owes it to themselves to download The Ghost Survivors this Friday. If you're still making your way through the main game, our Resident Evil 2 walkthrough has all the tips and info you need to survive the night.